The donation will send food to people in need in West Michigan and the Upper Peninsula. This afternoon, Terra GR announced that it would be donating the equivalent of 488 meals to the hungry through Feeding America West Michigan Food Bank. The fundraiser, which ended on Sunday, coincided with Experience Grand Rapids’ two-week-long Cool Brew. Hot Eats. showcase of local restaurants. 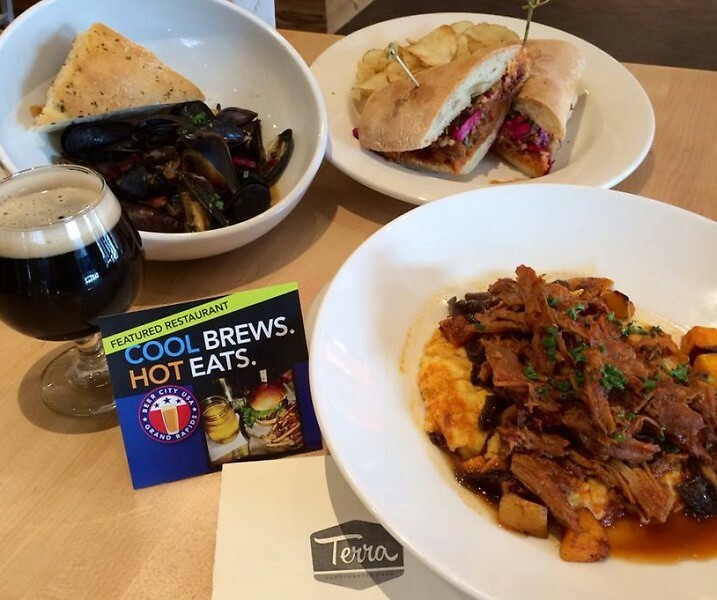 Terra created a special, beer-infused menu for the event, which included mussels steamed in Beatnik Blonde ale from Tapistry Brewing and curried barbecue pork made with Dark Horse’s Crooked Tree IPA. The mussels have been added to Terra’s permanent dinner menu. Terra’s donation supports Feeding America West Michigan’s mission to make food available to food-insecure people in 40 Michigan counties. Last year, the Food Bank distributed a total of 20 million meals, a record high for the organization.